The retro craze seems to be going in full swing now that the holidays are upon us. Retro telephones, retro fans, retro everything! But it takes a visionary to say “you know, I want to make a tiny, retro vacuum for people to use on their desks”. And you know what? That man or woman did just that. Over at Whatever Works, they’re selling the USB Desk Vacuum Cleaner. Standing a mighty 8″ high, this retro upright vacuum plugs into your computer or laptop’s USB port to pick up those cookies crumbs from your 3:00pm raid of the office vending machine. That family of dust bunnies that hide behind your computer monitor won’t be safe as it vacuums up everything in its path. Your OCD co-worker will ask to borrow it every day at 1:08 to clean up their desk. The vacuum is surprisingly nimble as it mimics a real upright vacuum by going from upright to almost flat to get under those hard-to-reach areas behind your monitor. It also comes with a 45″ cord, so it’ll clean even the largest desks. Perfect for the junk food junkie or neat freak on your office Secret Santa list this holiday season. And pick one up for yourself too, while you’re at it. Pick one up over at Whatever Works for $19.99. 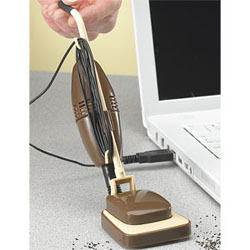 Interesting but, it would be handy to have a usb rechargeable keyboard vacuum. This has to be one of the dumbest things I have ever seen in my life but strangely I want one as it is also kinda cool.